Whether it's a big holiday bash or a regular Friday night gone wild, sometimes we have so much fun that we feel it all the next day. But that never stops us–a reason to celebrate is always welcome! Real talk: All of that excitement and celebrating can make it easy to enjoy your favorite beer, wine or cocktails a little too much–resulting in a vicious hangover in the morning. Hey, it happens to everyone! So, you're nursing a hangover and looking for a few ways to feel a little bit better? 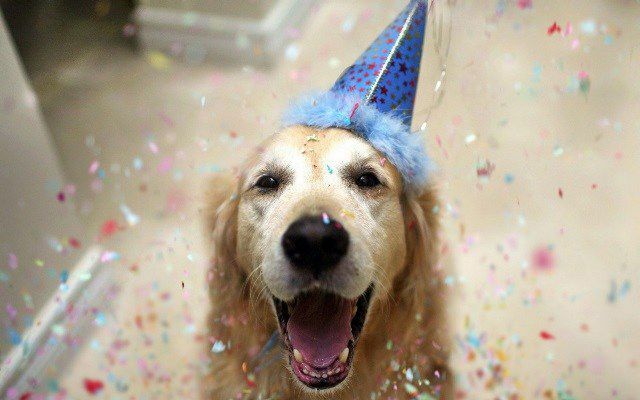 Take a cue from these cute dogs who also pawtied too hard, whether it was New Year's, their furry friend's birthday, or last Saturday night–they've got some great advice, after all. That feeling when you wake up in the middle of the night after a few hours of drinking and feel like you'll never, ever be able to adequately quench your thirst again. Drink up (and avoid any drinks that contain caffeine)! Drinking lots of water is one of the few remedies that actually works for curing a hangover. Sometimes the best cure for a hangover is to cozy up in your favorite blanket, order takeout and remain in a horizontal position in your bed all. Day. Long. Just avoid looking in a mirror if possible–you probably look a little bit like a goblin. Partied too hard last night? Your couch is your home now (but you've probably already realized that). You might as well kick back, relax and clock in a few hours with Netflix and your favorite salty snacks. The opportunity to have a lazy day on the couch rarely presents itself in our adult lives, so take advantage! If you dare going out in public with a hangover for some baffling reason, you can hide the bags under your eyes with your favorite shades. Just don't take them off, even if you're indoors. You wouldn't want to scare any small children, right? Editor's note: Seriously, the only good reason would be to go buy more Doritos. Believe it or not, feeling under the weather can have its upsides–especially after the hustle and bustle of the holiday season. How? You don't have to feel guilty about lounging on the couch all day; anything you eat is basically negative calories, as long as it makes you feel better; and you can shamelessly remain in your comfiest, coziest bathrobe all day–no pants with zippers or buttons for this guy! We all crave the greasiest, saltiest and least healthy food when we're hungover. And that's okay! Like we said, as long as your food of choice makes you feel better, it's basically negative calories. So go ahead and order that extra, extra large pizza with all the sodium-packed toppings you never get to eat, along with a non-diet soda. Pro tip: If you had a long night of imbibing, it may be wise to have a trusted friend go through your texts and delete anything embarrassing. Otherwise, you'll probably spend a few minutes making this face, wondering why in the world you decided to text that dude you dated for the first few weeks of freshman year to make dinner plans (that you're inevitably going to cancel). Didn't heed our text advice, huh? Then you're probably making this very face as you scroll through embarrassing text after embarrassing text. And a few attempted phone calls. And unintelligible Instagram comments. And hopefully some hilariously bad selfies. We all have that one (very svelte) friend who insists that exercising is the cure for a hangover. And the few times you've gone to yoga with her to "sweat it out," you most likely just kind of laid down on your yoga mat and watched her do a headstand or crow's pose or whatever. There is a light at the end of the tunnel! After a few hours of lounging on the couch or in bed, countless salty snacks, gallons of water and maybe even a yoga class (if you're that friend in your squad), you may actually start to feel like a human being again! Congratulations, you made it! Now you have time to prepare for the next big party.